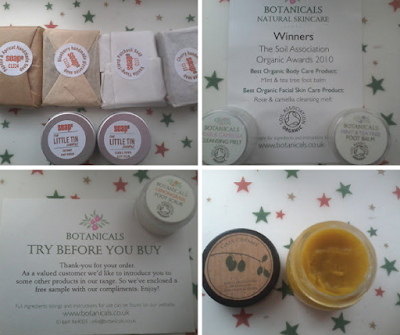 I thought I would share with you some natural beauty products that I have discovered on Twitter. When you have allergies being able to purchase samples an important step to finding suitable products. It enables you to patch test without investing in a full size which might turn out to be unsuitable. Soape sells handmade soaps, candles and skin care. You can buy 10ml sample tins of their body creams for £1 (currently on special offer for 80p). They also offer free 25g soap samples (maximum of 4 per order). When ordering samples postage is a flat rate of £2. My order consisted of Guava & Papaya body cream, Coconut body cream and four soaps - Cherry, Blueberry, Vanilla Ylang-Ylang Patchouli and Papaya & Apricot. These all smell amazing but they are very heavily scented so I would be extremely cautious if you have overly sensitive skin. I have tested the body lotion it was pleasant to use but I prefer a body butter this was very light. 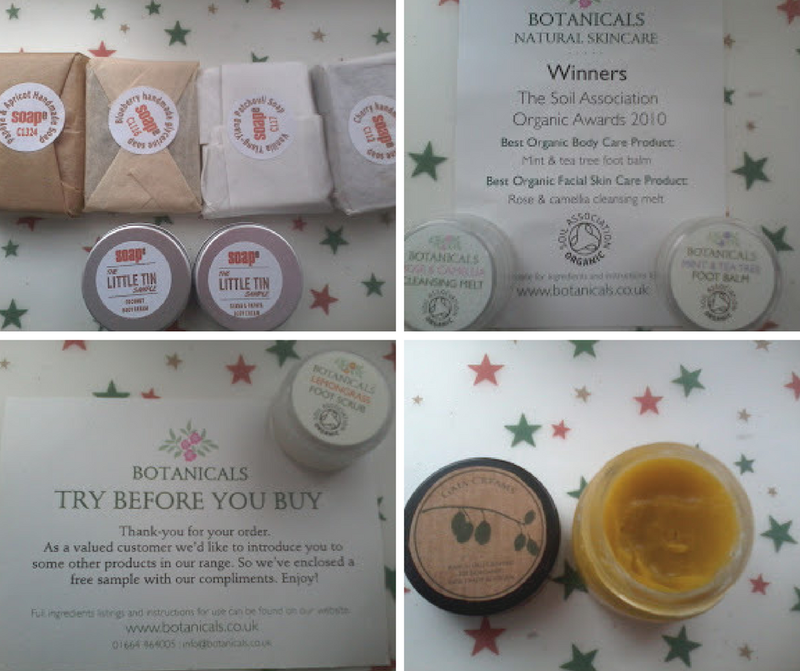 Botanicals is an award winning skin care line. They offer customers a free 'try me duo' of the awarding Rose & Camellia cleansing melt and Mint & Tea Tree foot balm. There is a small postage charge of £1.95. I also received with my order a bonus sample of the Lemongrass foot scrub. So far I have tried the cleansing balm which I do like and I am considering purchasing the full size. Alternatively if you wanted to try a larger selection of products Botanicals offer a skincare sample set for £7.95. The next product I am going to talk about I did find via Twitter but I was approached and offered a sample to test. Gaia Creams are handmade by Anna. She is very passionate about natural toxic free skin care so you are in safe hands with her products. Anna makes several creams to cater for different skin requirements. One of her creams is for eczema so this is the one I received. The cream has a beautiful soft buttery texture which transforms into a luxury oil when applied to skin. My skin absorbs this easily and is left feeling silky smooth. As an eczema sufferer you battle with trying to keep skin hydrated and this cream does a great job because it is full of rich natural oils. People with eczema do not have the same oil protection as healthy skin. Our natural protective barrier is defective which means skin dries out and is more likely to crack and become infected. You can not cure eczema but products like these help you to manage the condition and replace lost oils. If you have any skin problems then check out Gaia Creams and don't be afraid to ask Anna for advice. @Su I currently have the Papaya & Apricot in my soap dish and it smells lovely, it doesn't dry out my hands either which is a bonus. You are right about the cream it is very rich. I recommend the soaps I am still working my way through them so despite their size they last really well. My favourite was Papaya & Apricot.